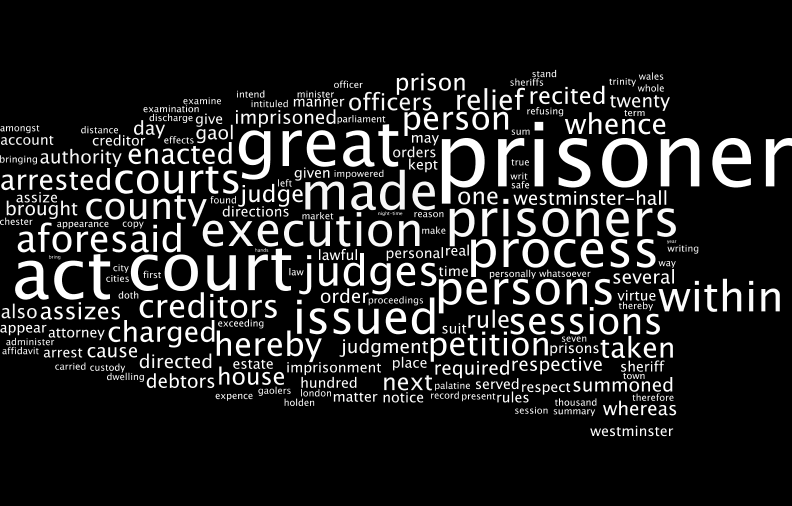 1730: 3 Geo 2 c.27: An act for explaining and amending an act made in the last session of parliament intituled, An act for the relief of debtors with respect to the imprisonment of their persons. WHEREAS by an act made in the second year of his present Majesty’s reign, intituled, An act for the relief of debtors with respect to the imprisonment of their persons, it is amongst other things enacted, That it should be lawful for any person or persons, charged in execution for any sum or sums of money not exceeding in the whole the sum of one hundred pounds, after the twenty fifth day of March one thousand seven hundred and twenty nine, within the prison of the Marshalsea, or county gaol of Surrey, and after the twenty ninth day of September one thousand seven hundred and twenty eight, in any other gaol or prison, to exhibit a petition to any of the courts of law from whence the process issued, upon which he, she or they was or were taken or charged in execution, in the manner by the said act directed; which court is thereby required, by order or rule of court, to cause the prisoner to be brought up, and the several creditors at whose suit he, she or they stood charged, to be summoned to appear personally or by their attorney in court, and upon any of their neglect or refusal to appear, upon affidavit of the due service of such rule and order, such court should in a summary way examine into the matter of the said petition, and also administer to such prisoner the oath in the said act mentioned and directed to be administred upon such examination as aforesaid: and whereas it hath been found inconvenient to bring prisoners up to the courts in Westminster-Hall from prisons that are at a great distance from thence, as the said act directs, by reason of the great difficulties and expences which attend the same: Therefore for remedying the said inconveniencies, and to the intent that the creditor or creditors may be the better enabled to inquire into the true state of the real and personal estate of any prisoner or prisoners who shall be in execution as aforesaid, on his, her or their account, be it enacted by the King’s most excellent majesty, by and with the advice and consent of the lords spiritual and temporal and commons, in this present parliament assembled, and by the authority of the same, That from and after the first day of Trinity Term next ensuing, before any prisoner or prisoners being in any prison (except such who are in the prisons in the cities of London and Westminster and the borough of Southwark) shall petition any of the courts in Westminster-Hall from whence the process issued, upon which he, she or they was or were charged in execution, in such manner as the said act mentions, such prisoner or prisoners shall give or cause to be given a writing, importing notice to the several creditors, at whose suit he, she or they shall stand charged as aforesaid, that he, she or they doth or do intend to petition the court from whence the process issued, upon which he, she or they was or were taken in execution, and also a true copy of the account or schedule in writing of his, her or their whole real or personal estate, which he, she or they doth or do intend to deliver into any such court, the said notice to be left with or served upon the said creditor or creditors, his, her or their executors or administrators, or some or one of them, or his or their attorney or agent imployed in such cause or causes,for which he, she or they shall be imprisoned. II. And it is hereby further enacted, That upon such petition made by any prisoner or prisoners to any of the said courts from whence the process issued, such court is hereby required to make a rule to cause the prisoner or prisoners to be brought, at an expence not exceeding twelve pence a mile, to be paid to the officers out of the effects of the prisoner, and in case the prisoner has not sufficient effects, then to be repaid by the treasurer of the county out of the county stock, to the next assizes to be holden for the county or place where he, she or they shall be imprisoned, if the same shall be within that part of Great Britain called England, and if within the principality of Wales or county palatine of Chester, then such prisoner or prisoners shall be brought to the next great sessions to be holden for the county where he, she or they shall be imprisoned; and the several creditors at whose suit such prisoner or prisoners shall stand charged as aforesaid, shall also be summoned to appear at the said next assizes or great sessions personally, or by his, her or their attorney or attorneys, by rule or order of the court from whence the process issued, to be served on such creditor or creditors, or to be left at his, her or their dwelling-house or usual place of abode, thirty days at the least before such assizes or great sessions. III. And it shall be lawful for the judges of assize or great sessions, or one of them, and he and they are hereby required to appoint a time for hearing the matter upon the said petition at and during such assizes or great sessions; and upon appearance of the creditors so summoned, or in default thereof, upon affidavit of their being so summoned, and duly served with such notice, and copy of account of such prisoner’s real and personal estate as aforesaid, and also with the rule or order of court for their appearance at such assizes or great sessions, the said judge or judges shall in a summary way examine into the matter of such petition, and hear what can or shall be alledged on either side for or against the discharge of such prisoner, upon which examination the said judge and judges is and are impowered and required to administer or tender to such prisoner the oaths in the said recited act directed and appointed to be taken by any prisoner before the judges of the court out of which the process upon which such prisoner was taken in execution issued; and the said judge or judges of assize or great sessions shall give such judgment, relief and directions as the court out of which the process issued for the taking of such prisoner in execution, might or ought to have given before the making of this act; which judgment, relief and directions, by the said judge or judges of assize or great session so given as aforesaid, shall be as good and effectual to all intents and purposes, as if the same had been made in the court out of which the process issued on which such prisoner was taken in execution; and the like proceedings shall be had thereupon, and a record of such judgment shall be made up in the same form, and returned and certified under the hand or hands of the judge or judges before whom it shall be made, unto the court from whence the process on which such prisoner was taken in execution issued, to be a record of the said court, and to be kept as such amongst the other records there. IV. And it is hereby further enacted, That the judges of the great sessions in Wales, and the judges of the county palatine of Chester, within their respective jurisdictions, shall and they hereby have the same cognizance, power, authority and jurisdiction for the relief of debtors, with respect to the imprisonment of their persons, who shall be imprisoned within their respective precincts, by virtue of any execution to be issued out of their respective courts, and to proceed in the same manner concerning the discharge of such debtor or debtors, and to give the same judgment, relief and directions relating thereto, as the said courts in Westminster hall are impowered and directed to do by the said herein before recited act. V. And whereas divers rules or orders may have been made by the Courts of law in Westminster-Hall for the bringing up of prisoners, pursuant to the said recited act, from prisons at great distance from the cities of London and Westminster, which have not been obeyed by the respective sheriffs or gaolers in whose custody such prisoner or prisoners then were, by reason of the great expence attending the same; be it enacted by the authority aforesaid, That all such rules or orders as have been made by any of the courts in Westminster-Hall, for bringing up of such prisoners to any such courts, and all attachments and proceedings thereon, be and the same are hereby discharged and made void; and that all sheriffs and gaolers be and are hereby protected and indemnified against all actions that are or shall be brought against them, or any of them, for not obeying such rules or orders. VI. And whereas by the said recited act the officers are restrained from carrying any person or persons by them arrested to any gaol or prison within twenty-four hours from the time of such arrest; and several persons, who have been arrested, refusing to be carried by the officers to any house whatsoever, to be kept in safe custody during that time, have kept the officers abroad with them in the night-time, and thereby have found means to make their escapes from such officers: be it therefore enacted by the authority aforesaid, That if any person or persons, after the first day of Trinity Term next, shall be arrested or in custody of any sheriff, under sheriff, bailiff, serjeant at mace or other officer or minister whatsoever, by virtue of any writ, process or warrant, and such person or persons so arrested shall refuse to be carried to some safe and convenient dwelling house of his, her or their own nomination and appointment, so as such dwelling house shall be within a city or market town, in cafe such person or persons shall be there arrested, or, if such arrest shall be made out of any city or market town, then within three miles from the place where such arrest shall be made, and so as such house be not the house of the person arrested, provided it be within the same county and liberty, that then it shall and may be lawful to and for such sheriff or other officer or minister to convey or carry the person or persons so refusing to such gaol or prison, as he, she or they is or are liable to be sent to by virtue of such writ or process; any thing in the said recited act to the contrary notwithstanding. Source: Danby Pickering, Statutes At Large, vol 16, pp.179-182.